In the wake of recent events surrounding relationships between Chicago theatre artists and critics, we at Kokandy Productions have been looking deeply at ways to give voice to a larger and more inclusive community. For the opening of Little Fish, we set aside 20 “guest press” comps, to be used by anyone willing to see the show and write a 500-1000 word response to/review of the show. We then published the reviews to our website – praise and criticism alike – below (in alphabetical order by last name). Please note: this is specifically intended for those who do not already have a public platform for their writing. I’m gonna give you the good word on Kokandy’s newest Bside: Little Fish. It’s a Lachiusa Deep cut that I hadn’t heard before, which was exciting for me, being the MJL head that I am! Ok so: This show is about a basic white girl that wants to quit smoking and is scared to go to Starbucks. Also, if that’s all you get out of Kokandy’s production of Little Fish, you’re really missing out. There is so much more here. This is also a show about connection, especially in a time when you feel like the world is falling down around you. We’ve all been there hunny, and if we gotta go thru the ugg boot Becky to do it, ok leggo. There are many lessons to be learned from our basic girl’s first world trials: the most poignant being how to deal with your personal crap while investing fully in your life and the lives of the people that care about you. That’s what comes thru the most: the people who take time from dealing with their own inner turmoils to honestly care about you, and how you genuinely reciprocate that love in spite of thinking your problems are all consuming. It’s a hard balance, and Allison Hendrix’s precise direction and careful placement of the characters navigates that with ease. The music is at once a reminder of the awkward period that was the post 911 early 2000’s and also a masterful guide thru the intense emotions of the story. If you’ve ever tried to quit smoking, you know the emotions of which I speak! The sound design is flawless and I must point it out. The cast sounded like they were in the band. It’s something to witness, especially with these stellar voices. While speaking of emotions, chile, I must give snaps to this powerhouse cast! Hunny they brought it up and sang down ok?! Our leading actor, Nicole Laurenzi, answered my “why should I care?” in about ten seconds. That voice, that vulnerability, the raw, babeeee! She dances through this almost milquetoast character with a grace only an actual human could apply. In fact, there’s a lot of humanity here; every single cast member brought it, and everyone gets a big feach so there’s no loss of gorgeous music and voices to drip upon. Shout outs to Jeff Meyer and Adam Fane for making hard theatre look and sound so easy. And the women in this cast are basically all beasts. It was cool to hear the blend and discord. Teressa LaGamba’s belt is the truth and the light and we must all partake of her greatness. The End. Kasey Alfonso’s choreo was all the things, easily shifting mood and style from year to year: showing Ms ma’am did her research. Good Job gurl!! I could spend days talking about the set, in fact it represents so much in the show that I shouldn’t even really ruin it for you! But needless to say, Arnel Sancianco does it again! That boy good! The show gives you small bits of information over the swiftly moving 90 minutes, by the time it all adds up, there is so much to unpack; you can really only just applaud. Bring your brain, eyes, and ears to this gorgeous show about basic folk. This is for grown folks; and man, did I appreciate that. Rush to see this show- And then take the steps to Reconnect! 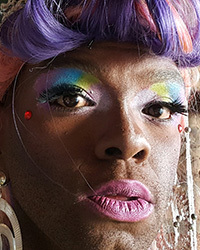 SHALITA CAKE is a drag queen with a theatre dream. Little Fish is the story of thirty something New York City writer Charlotte who decides to give up cigarettes while also trying to make sure the rest of her life doesn’t go up in smoke. Director Allison Hendrix tactfully brings us a Michael John LaChiusa scattershot musical written just after 9-11 that while not being about 9-11, reaches out and asks us to connect with others rather than withdrawal in the face of personal tragedy. As a book, it’s a show that may ask more questions than it answers. However, Kokandy’s production also lets us know that not having the answer doesn’t mean we still aren’t faced with the questions. Little Fish is truly a thinking person’s piece of art in many respects. While the golden age of musicals are characterized by classic songs and stories that wrap up their narratives with an undeniable grand finale tradition, Little Fish represents the modern musical. It is a story that examines the here and now and only asks of you to listen. Let’s talk production. As I walked in, I immediately admired Arnel Sancianco’s gorgeous set of deep navy toned platforms and floating squares peppered with hanging lightbulbs that are both nowhere and everywhere. Kory Danielson music directs and conducts an all-star band on one hell of a aural adventure with a wide variance of music styles encompassing everything from Irish ballads, to a Sinatra style pastiche, to an “all-skate” pop musical sing along. Kate Kamphausen’s jewel tone costume design brilliantly and subtly helps us recognize ensemble from named players in a show about joining the school of fish. Together, Alexander Ridgers’ and Michael J. Patrick’s light and sound design seamlessly and beautifully take us between the world and Charlotte’s perception of it. Choreographer Kasey Alfonso gives us movement that harkens back to your classic dancers. Her choreography is stylized, pointed, and bombastic. Hendrix and the people behind the scenes uniquely bring to life the world of this play. The performances in this play are stellar. These actors take you on a 90 minute ride with no stops, no slowing down, and no mercy for those in the outside lane of the running track at “The Y”. First and foremost, Nicole Laurenzi gives you all of herself in this play. Managing the 90-minute emotional rollercoaster role of Charlotte is a beast and Laurenzi wrestles it to the ground and hogties it with a song on her lips. Way to go, queen. As Charlotte goes down the road to a cigarette free fresh start, she is followed by her two best friends. Marco, played sumptuously and honestly by Adam Fane, tends to Charlotte and guides her journey a la Jiminy Cricket and Kathy, Charlotte’s friend who is perfect on the outside, human on the inside, is played with grace, humor, and honesty by Aja Wiltshire. Outside this classic movie watching trio, we see some really spectacular performances. Teressa LaGamba gives you all the wild and fun character choices one can make as Charlotte’s dress designing, cocaine enthusiast, first NYC roommate Cinder, while not sacrificing one bit a powerhouse vocal performance. Jeff Meyer sings gorgeously and is bitingly wicked in his portrayal of Charlotte’s emotionally abusive ex, Robert, whose memory and harsh words are the second habit Charlotte tries to quit. Rounding out the ensemble are Kyrie Courter, Carl Herzog, and Darren Patin. Overall, I enjoyed my time in the audience for Little Fish. I said my only real negative critique was that there wasn’t more musical. Kokandy, once again, does a spectacular job with a relatively unknown piece of art. Make sure you bring friends to this. Whether you’re looking at cave paintings, modern paintings, or modern musicals of little fish, you’ll want to mull over the intricacies and relevant nature of this piece with them. Different points of view on this will brighten your own understanding as it did for me. Ultimately, Hendrix masterminds a beautifully staged musical about a woman in her 30’s that is refreshing and relevant in this increasingly female future. 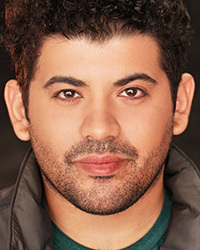 DIEGO COLON is an award winning composer who has been an actor, singer, writer, & sound technician in Chicago for over a 15 years. If you have ever been a young adult, recently moved to a new, big city, making a valiant effort to better yourself, you can likely relate to John Michael LaChiusa’s musical Little Fish— which just made its Chicago premiere at Kokandy Productions. Set in New York City, Little Fish explores the life of 30-something Charlotte, as she runs away to the Big Apple after breaking up with her abusive boyfriend, and tries to better her life by giving up her vices and taking up new habits, like swimming at the YMCA. The opening number, “Days”, presents the anxious, seemingly never-ending jitters that come with quitting smoking. The on-edgedness of kicking the habit is depicted in a way that the audience can feel exactly what it is like to take the final puff of a cigarette (even if they have never smoked), thanks to the sharp, rock sounds of LaChiusa’s compositions, and the pointed energy of Kasey Alfonso’s choreography. Similarly, when Charlotte is out on a date in the number “He” and has an self-image anxiety attack, director Allison Hendrix does a wonderful job of depicting the inner-workings of self-doubt by staging Charlotte alone with the demons in her mind (AKA her abusive ex-boyfriend, and other men she has dated). Of course, this is also partially due to LaChiusa for writing in Charlotte’s abuser, Robert, in as the face of her anxiety. Certainly, these moments in Little Fish are notable, and can give many audience members a picture of feelings they have that they wouldn’t otherwise wouldn’t see outside of their minds. However, the issue that lies within Little Fish is that while the moments are effective, they don’t add up to make a high-stakes story that is worthy of being a musical. This is not to say that every musical has to be a war-abandonment-death-romance, but there has to be something that merits 90+ minutes of singing and dancing. While lower-stakes work for some musicals, like Oklahoma! (which essentially is over 2 hours of a girl figuring out how to get out of riding with a creepy boy to the town dance in his car), such works get by as entertaining because they have flair— big sets, production numbers, costumes, etc. Whereas Little Fish is a minimalist musical. It’s set largely in small apartments, stores, and the YMCA, so it doesn’t call for gaudy sets or warrant flashy production numbers. It is safe to say that Little Fish is a good story on foundation, but would function much better as a play than a musical. However, the cast does a wonderful job of bringing the story to life and making the musical function at its best. Teressa LaGamba plays vivacious Cinder, a clingy cocaine addict whom Charlotte moves in with. Cinder is the most outlandish character in the show, and LaGamba’s grand stage presence brings an energy to Cinder that easily makes her the most entertaining character in the show. Jeff Meyer’s performance as Robert was appropriately douchey and painted a spot-on portrait of the snobby partner that I venture most people have dealt with at some point in their lives. 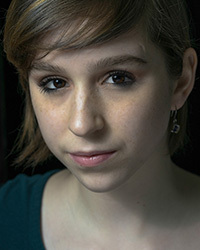 Kyrie Courter plays Anne Frank, in a short number where Charlotte recounts a dream she had about the Holocaust-era woman. Courter has a lovely voice and delivered an inventive performance of Anne Frank, a character who should have been featured more. Arnel Sancianco’s set design was simple, clean, and quite befitting of the story. The minimalist approach was definitely the right approach concerning this show, because it complimented the New York setting. The simple stage design acted as a track at the YMCA, a chic night club, and a bodega, to name a few. Nicole Laurenzi’s (who played Charlotte) commitment to her character made the extra mile in bringing the staging elements to life, through things as simple as the look of integrity and determination when she goes swimming. The ensemble of Little Fish is strongly united, and create beautiful harmonies together, effectively blending both musically and as performers. This production holistically a Beta fish. Little Fish is not a beast of a musical, like a Piranha, nor is it a cheap, unentertaining musical like a carnival-won goldfish. Rather, Kokandy’s production is thought-provoking, pretty, full of fresh talent, and will stay with you for quite sometime… like a Beta fish. 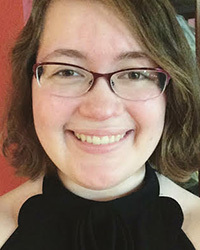 MELODY DeROGATIS a theater artist pursuing her BFA Musical-Theater/BA Writing major at Drake University, she loves roller coasters and spends way too much time watching House Hunters with her friends. Little Fish follows Charlotte, a young writer, who gives up smoking and runs away from an abusive relationship to New York to escape her dreary life, yet discovers that no matter how far she may run, she cannot escape herself. Depicting an inner struggle is often best served through literature, yet director Allison Hendrix does wonderful work with the daunting task of teasing out the subtle complexities of the interior life in musical form – a medium that is often reserved for grand, sweeping stories. At its core, this story is about recovery. Like many addicts, the main character Charlotte (compellingly played by Nicole Laurenzi) realizes that smoking was partially a replacement for a personality, and now without that crutch, she is adrift and faces the daunting task of personal growth. The rarely examined unglamorous reality of the daily hard work of recovery is unique territory ripe for discovery. Traditionally, the addiction narrative is a cautionary tale that allows the viewer to wallow and indulge in the guilty pleasures of excesses committed while under the influence – from a safe distance. However, smoking does not offer the same peaks and valleys as harder drugs like cocaine or liquor (a truth which could be played harder for comedic effect) so the focus on the banal mundanity of day-to-day life in recovery means that the core excitement and thrust of the story happens outside of the protagonist. Because Charlotte is woman who lacks her own personality, her story is told through vignettes with her more interesting friends. As the audience, we deliciously, painfully relate to as she compares herself to others that seem more adventurous, dazzling and intelligent – at least on the surface. (Facebook, anyone?) Charlotte is a heroine for our modern age of anxiety and inadequacy – Gen-X’ers and Millennials – two generations that will achieve less than their parents due to permanent changes in society and the economy, will relate deeply to the necessity of celebrating small successes to maintain sanity. Unfortunately, the device of storytelling through her friends backfires and becomes frustrating for the audience. One by one, interesting and complex characters appear and disappear: a deliciously douchey academic ex-boyfriend (hilariously costumed in a robe and ever-present mug of coffee – rare beans, one assumes) who berates her writing and undermines her confidence; her wild and crazy cokehead roommate (a fully committed and hilarious Theressa La Gamba – who steals the show); a carefree world-travelling girlfriend; a gay best-friend struggling with a tumultuous abusive on-again, off-again relationship; John Paul, a hoary stereotype, cringingly introduced as a “dark and handsome” fiery Latin lover. (Adding insult to injury, the rest of the cast sings an entire song about him as he dances there, mute, a POC prop. Ouch.) As each interesting friend leaves the stage, we are deflated and left with wallflower Charlotte, which has the effect of abruptly halting any momentum gained. Laurenzi is an undeniably wonderfully capable actress, who is unfortunately hampered by an emotionally restrictive script that offers her a limited range of expression until the third act. Her talent allows her to bring nuance and interest despite limitations. Charlotte’s narration detaches us from her emotions and holds us at arms-length from the story. We yearn to be in the deep end of the pool with her, yet we are left sitting on the chaise. Experiencing life vicariously through others is a poignant, valid perspective – but makes it difficult to remain invested in the story and retain empathy without more active struggle against her cowardice. Fortunately, we are offered an entry-point to her emotions through the exceptional musical score which buoys the limitations of the story. The composition is dynamically written and electrically performed by a full jazz-band, which commands attention from the first note of Act 1. Jazz captures the tyranny of the mind like no other art form and Little Fish hits its most fully-realized tone when breaking from realism and leaning into the abstract depiction of malaise. One of the most enjoyable noir-ish scenes is when Charlotte realizes with horror that she has more in common with her lecherous boss than she would like, allows us to deliciously leisurely luxuriate in ennui through in a gorgeous, soulfully sung and nostalgically crafted show-stopping song. The kinetic energy of the music begs for physical action, and the staging and choreography are satisfying, with actors literally jogging and jumping around the stage to illustrate Charlotte’s multiple failed self-improvement techniques. Future productions would benefit from investing in a corps of high-energy professional jazz dancers able to execute punchy, complex and expert-level challenging choreography. While dance might be optional for some musicals, for this one it is absolutely mandatory to successfully communicate and counterpoint the subtleties of her interior life and keep the audience rapt. Professional dance could take this musical from good to excellent. Despite its shortcomings, Little Fish has earned the right to keep it’s hook in the water for further exploration. Although the Act 3 epiphany feels a bit abrupt, unearned, and endearingly goofy, overall it is a well-directed, thoughtful piece that is wonderfully-performed and enjoyably sung by an excellent cast of strong vocalists. Ultimately, Little Fish is a musical for the Xanax generation; a defiant celebration of survival; an acceptance of the gift of functionality after addiction; a rebellion against forced excellence and the unrelenting expectations of society to ultimately find peace and actualization in the mediocrity of the average life. Little Fish offers a warning: those that fail to become the lead in their lives run the risk of being overshadowed by others in their own story. SHERI FLANDERS is a writer, actor, comedian, recovering Fashion Designer and cat enthusiast. Little Fish with Kokandy Productions is a roller coaster ride filled with laughs, sorrows, and phenomenal voices. It focuses on Charlotte, a writer in her early 30s, and her journey toward abandoning cigarettes and learning to love herself. She strives to reach this goal through running and swimming. In the beginning of the musical, we learn that Charlotte, played by Nicole Laurenzi, has moved to New York City to continue her career as a short-story writer. We learn that she moved from Buffalo to get away from her lover Robert. Laurenzi eloquently made the audience feel the pain that her character felt during this stage of her life through her heartfelt monologues and crisp singing. In the beginning of the musical we are introduced to Robert, played by Jeff Meyer. Meyer delved into the role of Robert and I was able to completely believe the abusiveness of his character. It was clear that Meyer did his research as he demonstrated many characteristics of an abusive partner. Soon we are introduced to Charlotte’s first roommate, Cinder, played by Teressa LaGamba. Cinder by far was the most memorable character for me. LaGamba’s comedic timing was stunning and made me laugh out of my seat whenever she spoke. Her vocal range was impeccable and always kept me at edge of my seat. LaGamba blew me away with her song “Poor Charlotte”. She was able to sing her heart out while acting emotionally and physically. Whenever she graced the stage, she brightened it up. I would have loved to see more of her on the stage. Another character that blew me away whenever they were on stage was Kyrie Courter, who played Anne Frank. Courter had a voice of an angel. Although Courter wasn’t on stage as much as other characters, she commanded the stage whenever she was on it. Charlotte has several love interests throughout the musical. Each man represents a different time in her life and Laurenzi showed that with her ability to transform Charlotte throughout the show. As well as love interests, Charlotte also introduced several of her friends to us throughout the musical. In the beginning of the play, we meet Charlotte’s best friends Marco and Kathy, played by Adam Fane and Aja Wilshire. Fane portrayed his character hilariously as his comedic timing was spot on. 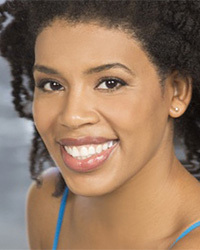 Kathy, played by Aja Wilshire was the most likeable character. Wilshire’s genuine portrayal of Kathy showed the true meaning behind being a best friend. When I learned of Kathy’s situation toward the end of the play, I couldn’t help but feel sympathy for the character. Wilshire tugged at my heart with her song “Remember Me”. Along with LaGamba, Wilshire sang with grace and ease while acting throughout the song. .
At the end of the play Charlotte spirals out of control and we watch her almost take a puff of her cigarette. This moment in the musical is simple but speaks volumes. At this moment Charlotte cracks and we see her vulnerable side for the first time. Laurenzi opens up to the audience in a way we didn’t see before and it was a beautiful moment. This is also a memorable moment because it’s relatable. We’ve all had moments where we wanted to give up. However, Laurenzi brings the strength out of Charlotte that’s been hiding the entire show when she successfully beats her cigarette addiction and comes out humble, wiser, and stronger. This musical is a life lesson to everyone. Every last person on the stage contributed to the light that shined throughout the show. They all helped convey the message beautifully and left a warm feeling in my heart. 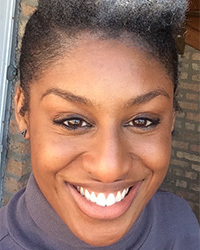 KHLOE JANEL is an actor, singer, and poet in Chicago. Charlotte from Kokandy’s production of LITTLE FISH is me. She’s also you. Sitting in the audience I felt like I was watching myself over the course of the last year. Thirty something- check (well 33 to be exact). Bad break up- check (I assume a divorce counts). Trying to find yourself- check, check. I don’t know anyone who hasn’t at some point found themselves at a cross road in life and struggled to figure out how to navigate in the sea of life. (And maybe find happiness?!) I may have never smoked, but I did become addicted to being BUSY. Anything to shield me from actually feeling. The journey for Charlotte continued throughout the play as she slowly battled the demons of her past. At the end of the play Charlotte and her friends were simply sitting watching a movie and Charlotte looks at her friends and says, “This is a good moment.” Life is good. Life can be good. Overall there is something for everyone in this musical. So many themes are experienced that while you may not relate to all, there is definitely something for everyone. One friend of mine who attended the play said it was geared more toward women, and while that may be true because the main character is a women, there are still experiences that are not defined by gender. My boss at work asked if it was appropriate for children. I explained that there were some drug references so if she was cool talking to her kids about drugs then they would enjoy it. It is fast paced, witty and real. All of the actors did an outstanding job and I would highly recommend it. KAREN LAWHEAD is a thirty-something, suburban Crossfit enthusiast who lives on coffee and craft beer. “Little Fish” follows short story writer Charlotte as she precariously navigates life after a breakup with her pompous and dismissive boyfriend, Robert. Her struggles to quit smoking, find happiness through exercise, and write a story for the first time in years seem to symbolize her journey. The play is mostly narration and is sprinkled throughout with detailed vignettes. Despite the inclusion of song and dance, the mood of Little Fish is pensive and slow, seemingly beckoning its audience to think instead of just applaud. Michael John LaChiusa, the writer, apparently intended for Little Fish to capture the need to be near loved ones after the 9/11 tragedy. While the sense of hopeless and longing is present, Little Fish ultimately fails to portray this message adequately. Charlotte’s ex-boyfriend, Robert (Jeff Meyer) personifies her suffocating inner voice and is the smartest artistic choice of the entire production. Besides Charlotte (Nicole Laurenzi) and Robert, the next character we see the most is Charlotte’s best friend Kathy, played by Aja Wiltshire. Kathy is a fashionable, put-together woman who seems to embody the modern phrase“adulting.” She is strikingly basic against the backdrop of what feels like a mainly cerebral plot. Her strongest moment has to be a feminist song “Perfect,” a response to being called beautiful by Charlotte upon their first meeting. It’s an outdated address of body-shaming but still a standout moment for the character, who spends the rest of the play lamenting old boyfriends, praising new ones, and convincing Charlotte to get back into the dating game. What could have been a very human extension to her story is revealed near the end of the play, but unfortunately this never gets explored. This same conundrum follows Marco’s character, who is Charlotte’s other best friend. The show is run without a stage curtain, relying on creative lighting to change sets and set scenes. This arrangement makes for a natural, cohesive flow that never makes the audience wait. The set ups, though simple, are smartly constructed, and whatever nuance is missing, the casts’ skill provides. This show also includes a live band as accompaniment that plays a jazzy, urban score worth a reviewer’s mention. Besides the music, particularly stand-out performances include that of Cinder (Teressa LaGamba), Charlotte’s roommate after leaving her boyfriend, Robert. She is dramatic, extreme, and the primary source of comic relief. LaGamba does such a fantastic job playing this character that her performance far outshines her role. Adam Fane’s portrayal of Marco is also worth mentioning, namely his delivery of the deeply emotional song “Little Fish,” a song that addresses Charlotte’s passive and apathetic response to his relationship. While the cast is undeniably talented, the story tends to fall short. Charlotte’s journey to self-actualization starts out being very relatable and pointed but ends up cliché and flat. The complexity of Charlotte that the entire story focuses on crescendos to a relatively simplistic moment that feels like a rushed turning point. Just as any supplemental characters are becoming three-dimensional, the final scene ends, and we never learn why we were tantalized with their individual stories. This oversight is a flaw that can sum up the overall feeling of the show; while it teases a complicated, melancholy story meant to parabolize a major national catastrophe, theatrically Little Fish does not dive much deeper than the surface. CANDICE LOLA is the flash fiction writer of CandiceLola.com, a circus freak, and an astronomy nerd who will vehemently deny all of this if asked in person. Michael John LaChiusa’s Little Fish follows the story of Charlotte, a woman who moves to New York City for a change of pace. Swapping her mentally abusive ex boyfriend for a crackhead roommate she barely knows, Charlotte learns quickly that life in the big apple isn’t as glamorous as the stories make it out to be. And, to make things all the more difficult for our protagonist, she makes the courageous decision to quit smoking. However, she doesn’t feel too strongly about going cold turkey so abruptly. Now Charlotte must cope with symptoms of withdrawal, the constant self-doubt that her past relationships have conditioned her to feel, and the sudden realization that smoking all these years has hid so much personal baggage she must now learn to live with. Seeking out the guidance of her good friends, Cathy and Marco, Charlotte learns that, while friendship may not be perfect, there is nothing more rehabilitating than the support of the ones we love. Despite many stumbles, both literal and otherwise, Charlotte accepts that she doesn’t need to hide behind a cigarette anymore. She holds the power to fix her life in her hands, the same hands that held the cigarette all those years. LaChiusa’s writing is enthralling; both humorous and conflicting, it commands our attention throughout the whole show. Little Fish maybe a rather obscure story, but it is, frankly, an underrated one as well. This charming story of Friendship, Self Acceptance, and Personal Triumph will leave you feeling joyful and motivated to take control of your life by the reigns, and steer it in the direction of who you truly want to be. Immediately, I felt the liveliness of Nicole Laurenzi’s (who plays Charlotte) performance. As her voice met my ears, a smile spread across my face. Bring in the rest and I was like “Dang!” This is a powerhouse cast. The vocals collectively and individually were amazing. Standouts to me were: Carl Herzog (who plays Mr. Bunder), who had a voice that reminded me of Frank Sinatra and Tony Bennett; Jeff Meyer’s portrayal of obnoxious ex-boyfriend Robert had me living; Teressa LaGamba showed off her impressive belt as humorous and eccentric roommate Cinder. Nonetheless, EVERYONE had me screaming “Yas!” The cast is phenomenal. I absolutely loved the simple yet abstract scenic design by Arnel Sanciano. Allison Hendrix, Artistic Director of Kokandy and Director of Little Fish, expertly used the space to her advantage. From having the ensemble cover every inch in the opening number to utilizing the space as a running track. Alexander Ridger’s lighting framed the set quite lovely. From isolating moments with fellow runners on the track, to the eerie vibes of Robert, to the overall emotional journey of Charlotte (which also matched the score.) I really enjoyed Kasey Alfonso’s choreography, especially the use of the cast as a a whole in the opening number. Kory Danielson’s music direction was everything. Those harmonies were tight. Shoutout to the band who sounded amazing. I found myself looking over at them because I could see they were enjoying themselves and I loved that. LaChuisa’s jazz score filled my heart with warmth. The music is so addicting and catchy, I found myself listening to the cast recording non-stop, starting my morning with “Days”. Kokandy’s production of Little Fish had me so in love, I just had to come back a second time. And it was just as amazing as when I first saw the show. Definitely would recommend for people to come see this production! 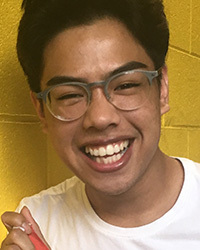 JIMBO PESTANO is an out and proud queer Chicago actor who enjoys doing drag in their free time and plans to major in Musical Theatre in college. To me, one of the most unsettling things about existing as a person is realizing that no one grows up entirely. We are all just works in progress, engaging in a futile quest for perfection that throws more curveballs than it does victories. I see this commotion of emotion in myself, and also in Charlotte (Nicole Laurenzi), the turbulent protagonist of ‘Little Fish’, now in its Chicago premiere under the direction Allison Hendrix. However, the chaotic reflection of life that Michael John LaChiusa (who wrote the book, music, and lyrics) has crafted does not always mix well with the moments of earnestness that Hendrix has skillfully carved out. Life is equal parts disorder and gravity, but the ways in which Kokandy’s production attempt to meld the two creates more of a disjointed experience. Charlotte’s decision to give up smoking by taking up swimming and jogging, along with a new friend cohort in a post 9/11 New York should bring with it a sense of sizzling energy, but instead consumes a talented and strong ensemble and transports us to nowhere in particular. I thought at first that the musical takes place within Charlotte’s mind, creating a madcap experience similar to that on the CW television show ‘Crazy Ex-Girlfriend.’ Such a display of neurotic behavior would ideally help underscore the need for the voiceovers, engineered by Michael J. Patrick. Instead, those voices hung in the air with no clear link back to Charlotte’s threadbare world. The production itself seems to feel the weight of all it takes on, and struggle to take it to new and more dynamic places. The madness present in Charlotte’s major life change is palpable in the opening number (“Opening: Days”), but almost immediately deflates into a strange mix of scenes that could potentially benefit from a more linear reordering. Charlotte’s journey of learning how to live with herself only gets more tumultuous, but those moments feel unable to match the pandemonium present at the beginning. The production struggles to find its heart until Kathy’s (Aja Wiltshire) deeply heartfelt and nuanced song (“Perfect”), sung in part with Charlotte and lays a lot of the groundwork for what the musical (might) ultimately be about. LaChiusa’s musical almost feels overstuffed with events and characters that singled out could lead to greater significance, but when muddled together only serve to bog down the musical as a whole. Robert (Jeff Meyer, through July 30) in particular could do with some more fleshing out. Over time, we learn about his hold on Charlotte, with him becoming a twin vice from which to escape. Despite this influence, the biggest takeaway I got from him was that he was always in a bathrobe, a devil on Charlotte’s shoulder. ‘Little Fish’ attempts a lot in its 90 minute run time, with one aspect in particular holding a lot of significance – the exploration of absolute good. Charlotte’s quest for perfection lays just beyond her reach. No matter how many laps she runs or how hard she swims, perfection is not waiting for her at the finish line. Ultimately, a little fish can evade a big fish by learning to swim with it, and not against. The big fish might feel just as lonely as the little fish, and need a companion to navigate the waters with. 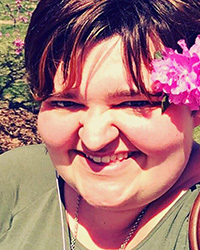 LAUREN QUINLAN is a freelance writer, dramaturg, critic, and recent graduate of The Theatre School at DePaul University with a BFA in Dramaturgy/Criticism. QuinQuinlan.com. Little Fish is a story about a woman by the name of Charlotte struggling with her smoking problem and trying to replace it with other vices but all the while digging up unwanted feelings from her past toxic relationship. Throughout the 90 minute show we follow Charlotte’s journey as told through upbeat and jazzy song. Let me begin with this, it was undoubtedly well done. Nicole Laurenzi is a determined Charlotte and able to fill the stage with her strong voice along with her classic “perfect” best friend Kathy as played by Aja Wiltshire. Despite these two women being able to truly carry their weight on stage, I still wish I could’ve heard more and seen more from Teressa LaGamba who portrayed Cinder. During her main solo number I was taken aback by the strength in her voice and was disappointed to not hear more of it on its own throughout the play. All of this being said, the production value and the performances were well done but I cannot recommend this play due to the play itself. I found myself struggling to understand what the plot was throughout the entire show. During the last 15 minutes I sort of came to the conclusion that it was about her quitting smoking but couldn’t really be sure and still am not quite sure. Along with this, the characters felt stereotypical. I knew exactly what kind of person they were going to be within the first 15 minutes, they lacked any type of depth that really makes us human therefore making them boring to watch and follow. For example the group of friends (Charlotte, Kathy, and Marco) were easy to put in a box from the start. You have your shy but cute protagonist Charlotte and her seemingly perfect best friend Kathy who everyone looks up to, and finally the sassy gay best friend that wants you to see all of his favorite indie arthouse films. And of course, they all drink wine straight from the bottle because they are “just so crazy like that”. I’ve seen these characters over and over again and they become easy to write and therefore boring to watch. Overall, the music was entertaining enough and the production was enjoyable but the actual story dragged it down and made it hard to watch. We’ve all seen this story before, one way or another, and it gets old, very old. 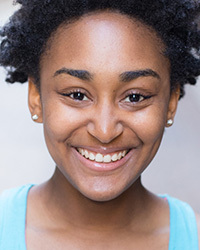 CLEO SHINE is currently a rising senior at Senn Arts High School and a company member of The Yard Theatre Company. 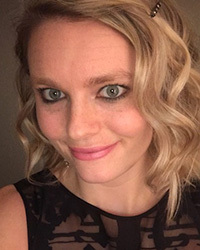 Along with a performer she is also a stage manager and currently holds the title of digital assets manager at The Yard.